Jeanneane Maxon, J.D. | February 28, 2019. If you have spent any time on American roads in the past five years, you have likely noticed cars with pro-life license plates sharing the road with you. Pro-life license plates are currently available in the District of Columbia and 32 states. 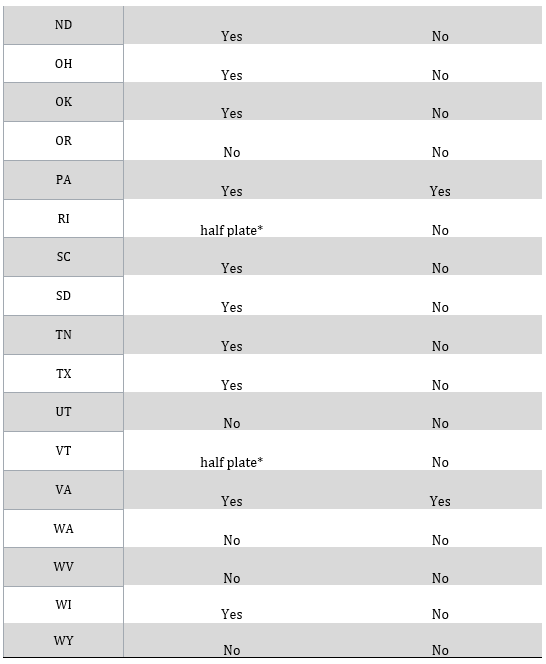 The Children First Foundation also makes a pro-life “half-plate” available for five additional states, which can be attached to the top or bottom of a standard DMV-issued plate. Pro-life license plates come in various styles, the most common of which is a yellow plate with a child’s drawing of a boy and girl and the words “Choose Life.” Typically, after the State subtracts an administrative fee, the proceeds of pro-life license plate sales are distributed, sometimes through an intermediary, to pro-life pregnancy help centers, maternity homes, or organizations offering adoption services. Curiously, there is a notable absence of “pro-choice” license plates on the road. 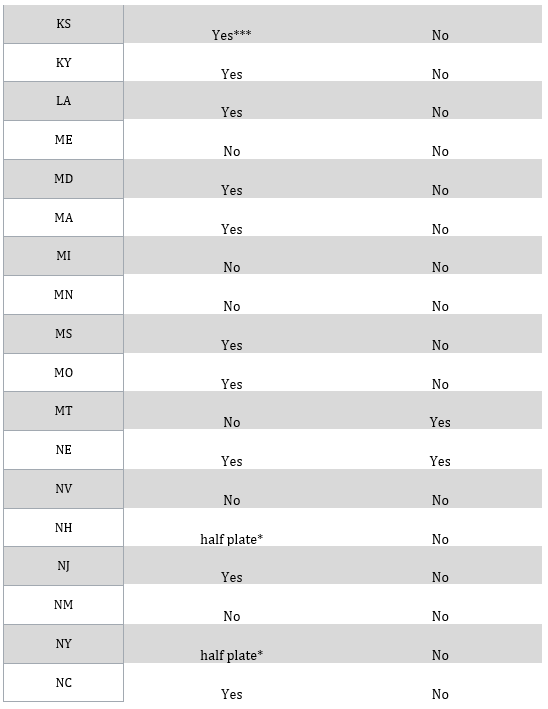 Only four states currently offer a pro-choice plate option: Montana, Nebraska, Pennsylvania, and Virginia. In all four of these states, pro-choice plates advertise a local or regional Planned Parenthood. Three of these states offer both a pro-life and pro-choice plate: Nebraska, Pennsylvania, and Virginia. No adequate study exists as to why American drivers have so predominantly chosen pro-life plates over pro-choice plates. Sometimes the state legislature rejects a pro-choice plate bill. Other times, pro-choice activists in the state are unable to reach the required number of pre-sales for the state motor vehicle agency to create and offer the plate. Even states hostile to pregnancy help centers appear to have difficulty producing a pro-choice plate option. In states that have both options, pro-life plates greatly out-sell their pro-abortion counterparts. In California, where the extreme pro-abortion legislature recently violated the constitutional rights of pro-life pregnancy centers by requiring them to refer clients for abortion, a 2017 Senate Bill authorizing a “California Trusts Women” plate died in an Assembly committee. Planned Parenthood of Hawaii has tried for years to obtain the required pre-sale of 150 plates. In 2003, the League of Women Voters in Hawaii reported that Planned Parenthood was only able to secure around 20 presale orders. Drivers in Massachusetts have been able to order a Choose Life plate since the summer of 2010. Nonetheless, pro-choice plates remain unavailable, despite extensive efforts of pro-abortion advocates to collect the required 3,000 signatures and 3,000 license plate presales. Virginia is one of the three states that has both a pro-life and pro-choice plate option. The Virginia DMV reports that Virginia Choose Life plates are decidedly more popular than the “Trust Women, Respect Choice” license plates. In fact, in fiscal year 2017, the Virginia DMV issued more than 2.5 times as many “Choose Life” plates (5,739) as pro-choice plates (2,270), generating more than 2.5 times the income for pro-life pregnancy help centers ($86,065) than for Planned Parenthood ($34,050). On December 27, 2017, Nebraska started both selling Choose Life license plates and Planned Parenthood of the Heartland plates. As of May 1, 2018, 1,159 Choose Life plates have been sold compared to 309 Planned Parenthood of the Heartland plates. Choose Life license plates are available for a fee of $5 (for a generic numeric plate), or $40 (for a personalized plate). As an “organizational plate,” Planned Parenthood of the Heartland plates sell for $70. However, neither pro-life nor pro-choice organizations are recipients of the revenues. After administrative fees are provided to the Nebraska DMV, revenue from Choose Life plates is provided to the Nebraska Health and Human Services Department to supplement the federal monies for the Temporary Assistance for Needy Families program (TANF). Revenue from sales of Planned Parenthood of the Heartland plates is provided to the Highway Trust Fund of the Nebraska Department of Transportation. In Pennsylvania, the numbers are even bleaker for pro-choice supporters. Currently, only 14 Planned Parenthood of Pennsylvania plates are registered as active with the Pennsylvania Department of Transportation (PennDot), compared to 970 Choose Life plates. In Pennsylvania, drivers purchase specialty license plates directly from an organization, such as Choose Life Pennsylvania (http://www.pachoose-life.org/) or Planned Parenthood Pennsylvania Advocates (http://www.plannedparenthoodpa.org/). PennDot charges a $26 fee for specialty license plate, but organizations are permitted to charge and retain a fee on top of the PennDot fee. Choose Life Pennsylvania currently charges $52 per plate including the PennDot. As of May 6, 2018, Planned Parenthood of PA has not responded to an inquiry, dated April 24, 2018, regarding its process for obtaining a Planned Parenthood plate. 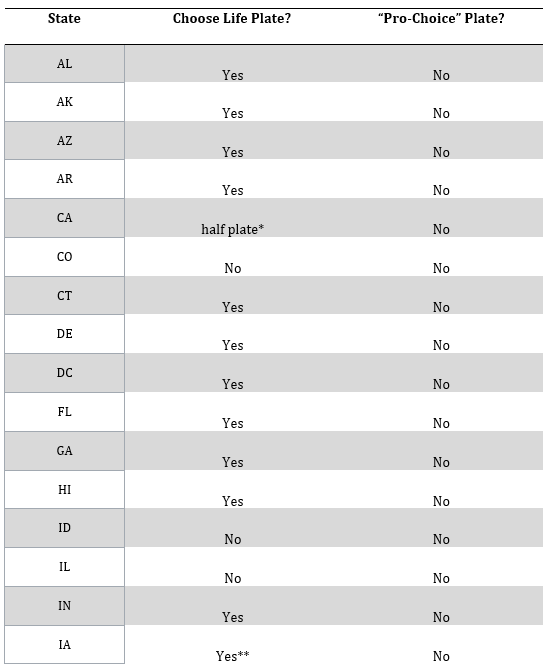 The chart below shows which states offer pro-life and/or pro-choice license plates. *The Children’s First Foundation offers a half plate, which can be attached above or below any standard-issue state DMV plate. CA also has a specific group active in promoting the half plate option. **Proceeds in Iowa go to Iowa roadwork. ***In April 2018, Kansas Gov. Jeff Colyer signed a bill authorizing a pro-life plate for sale in 2020. Before the plate can be made available for sale, 1,000 pre-sales must be completed. For more information visit: www.chooselifeplate.com. Jeanneane Maxon, J.D. is an associate scholar for the Charlotte Lozier Institute. This is an updated version of an earlier paper. CA SB-309 (2017). See http://leginfo.legislature.ca.gov/faces/billHistoryClient.xhtml?bill_id=201720180SB309 (accessed 26 April 2018). See also, Bilgar, Micaiah. “California Assembly Rejects Pro-Abortion License Plates to Fund Planned Parenthood Abortion Biz” LifeNews.com, 12 Sept. 2017. Available at: http://www.lifenews.com/2017/09/12/california-house-rejects-pro-abortion-license-plates-to-fund-planned-parenthood-abortion-biz (Accessed 26 April 2018). The League of Women Voters of Hawaii, “Ka Leo Hana” Convention Edition 2003. Available at: https://www.lwv-hawaii.com/kaleohana/klh0306-hawaii.htm (assessed 26 April 2018). Prochoiceplates.com, “Introduction.” 23 June 2011. Available at: https://prochoiceplates.com/ (accessed: 26 April 2018). Brubaker, Brandy, Virginia DMV, Public Relations and Media Liaison. Personal Interview. 24 April 2018. Johnson, Betty, Nebraska DMV, Administrator, Driver and Vehicle Records. Personal Interview. 5 May 2018. Nebraska Legislative Bill 46, 2017. Available at: https://nebraskalegislature.gov/FloorDocs/105/PDF/Final/LB46.pdf(accessed 6 May 2018). As of May 1, 2018, Nebraska has collected $13,635 in proceeds from Choose Life plates, with $2,240 kept by the Nebraska DMV, and $11,395 distributed to the Nebraska Department of Health and Human Services. For Planned Parenthood of the Heartland plates, $21,630 has been collected with $3,244.50 kept by the Nebraska DMV, and $18,385.50 to the Highway Trust Fund of the Nebraska Department of Transportation. Campbell, Alexis, Pennsylvania Department of Transportation, Community Relations Coordinator. Personal Interview. 4 May 2018.